Frankart (American 1920s-1930s), number unknown. 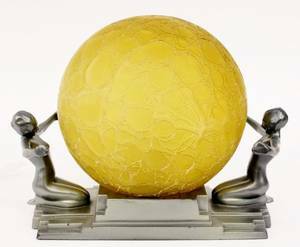 Original Frankart figural globe lamp depicting two young female nudes with exterior arm wrapped gracefully behind their back flanking a large amber colored crackled globe form shade that diffuses light emitted from the bulb within. Marked on back edge "FRANKART INC. PAT.DES. 80153. 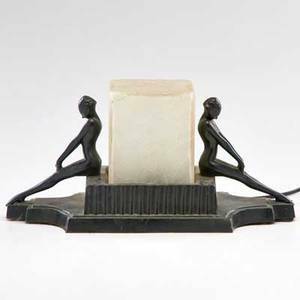 Figures and stepped Art Deco base in gunmetal finish. Height 9". 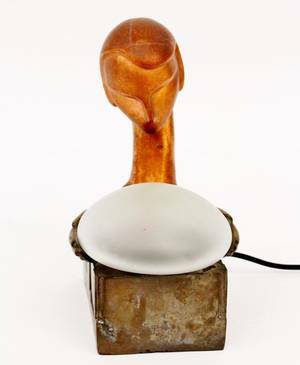 Frankart; figural desk lamp with two seated women, new york, 1920s; ebonized metal, frosted glass; unmarked; 7 1/2" x 14" x 6 1/4"